New York Islander Cal Cutterbuck skates past the bench and celebrates after scoring last night against the Anaheim Ducks. The New York Islanders continue to dominate with superior defence and the execution of timely scoring, and that came through in full glory on Sunday night as they annihilated the Anaheim Ducks 3-0 earning Robin Lehner a shutout. New York’s Cal Clutterbuck had a big night scoring twice on a night that saw Lehner with 19 saves. Also scoring for the Islanders was Leo Komarov and assists were awarded to Josh Bailey, Anthony Beauvillier, Scott Mayfield, Adam Pelech and Devon Toews. The win was New York’s fifth in the row and their 15th out of the last 18 games played. 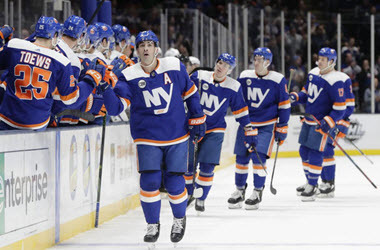 The success has seen the New York Islanders pass the Capitals and Blue Jackets to take first in the Metropolitan Eastern Division and are now sitting in fifth place overall in the league. New York scored first while on a power play when Cal Clutterbuck slipped the puck past Chad Johnson with slick passing skills. It was the sixth game in a row that the Islanders were first to score. With Josh Bailey’s assist, he is now tied in 12th place on the all-time assist record with the Islanders with 279. Bailey also tied team captain Anders Lee in points at 37. This is the sixth year Clutterbuck has played with the Islanders and was been a big part of its success this year having scored twice in their 2-0 win against the Washington Capitals on Friday. 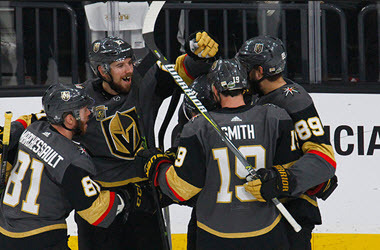 Punters following the Islanders will be interested to learn that when the Islanders score three or more in a game, they are 25-2-1, and that is valuable information when placing bets on future games with leading sportsbooks such as Spin Palace Sports. New York has one remaining game against Chicago before breaking for the All-Star game as does the Anaheim Ducks, who will play a home game against the St. Louis Blues on Wednesday.